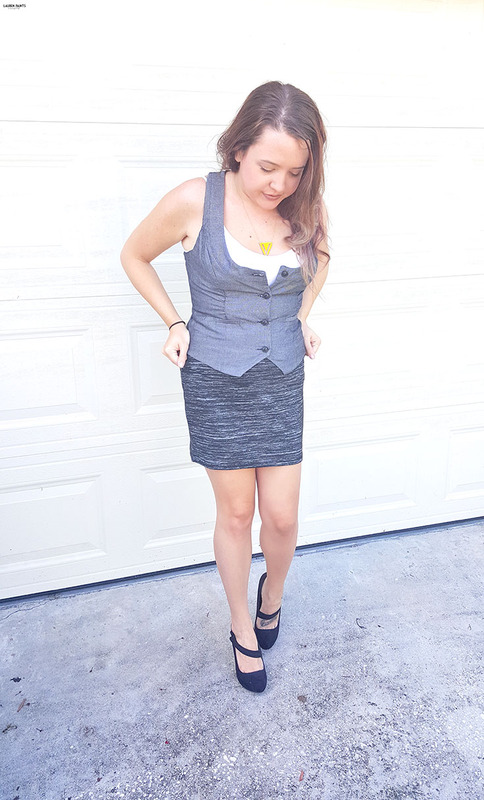 Get Fixated on Stitch Fix This Fall! 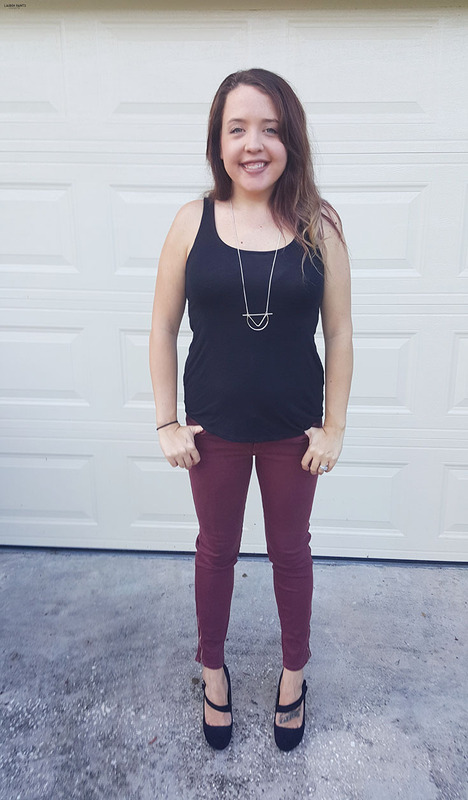 It's my favorite time of the month, my Stitch Fix arrived and I'm TOTALLY digging the items they sent over! With so many pretty pieces to add to my wardrobe, I was trying to convince hubby that the discount for buying all 5 items is worth it... and once he saw the items on, I think he actually might agree, maybe a little bit... 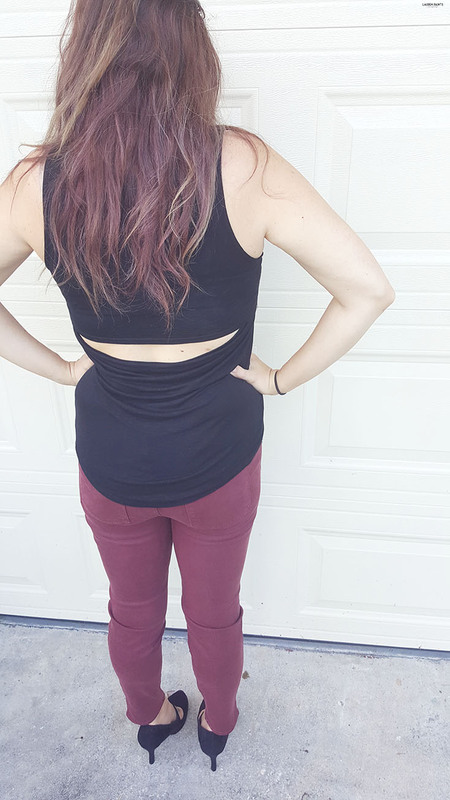 So this fix was a total win in my book and I need your help deciding which pieces to keep... I think maybe all five, but then again maybe not... what do you think? 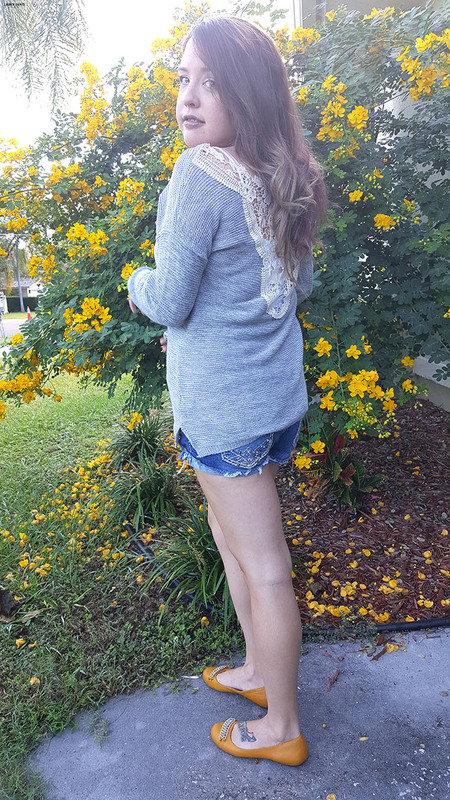 Let's start with this gorgeous grey sweater with a beautiful lace detail, it's pretty much the definition of a pinterest-loving girl's dream addition to her closet. I may or may not have squealed a little with delight whenever I opened the box and saw this beauty. It's just loose enough to be comfortable for any day wear and the beautiful lace/ crochet back is just darling. 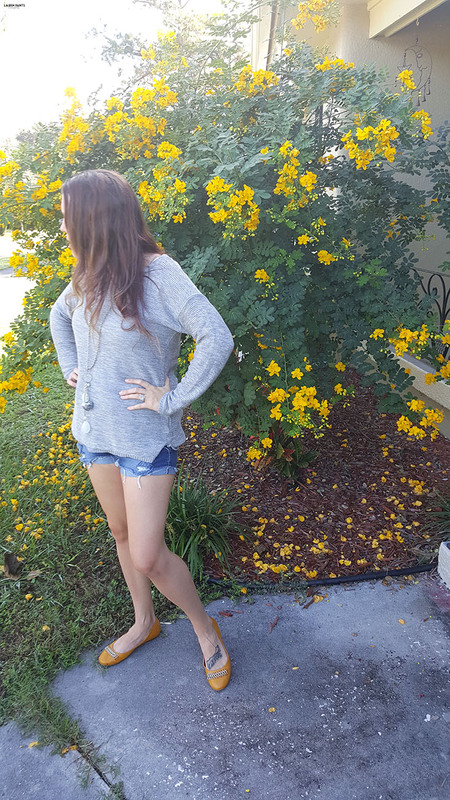 Since it's still kind of warm here in Florida, I paired this little piece of lovely with a pair of jean shorts and a canary yellow pair of flats - completing the perfect "Autumn" look for a beachy gal. I think it's obvious by my endearing description that I will probably keep this sweater, but what do you think? Moving on to the next item, I thought I was sending this cute little number back at first, but now I'm wavering. I thought the skirt was too fitted when I first saw it in a mirror... but then I saw the photos and I actually kind of like the fit. The material is so soft and the band sits perfectly on my waist, giving my shape a bit of curve... 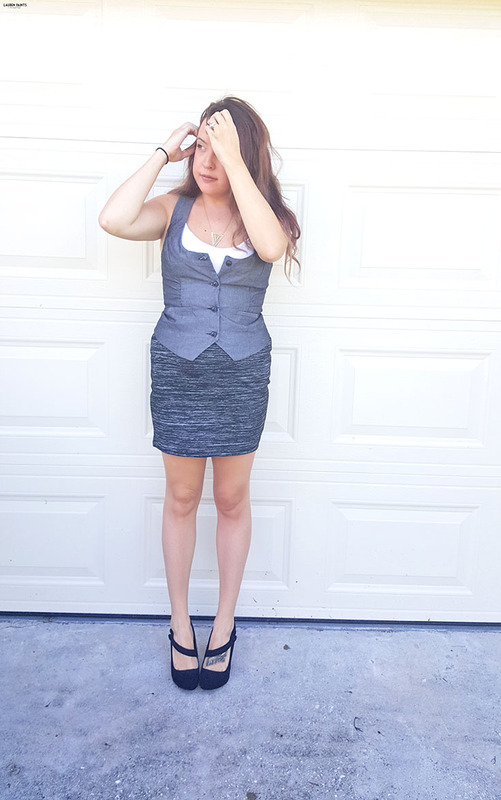 The grey tones in this and my grey little vest are the perfect pair, especially with my black high heels! I can totally see me rocking this look for a night out with the girls, but what do you think... is the skirt a keeper or no? My last 3 items I would like to share as just one single outfit, they all matched and looked cute together so it just made sense! 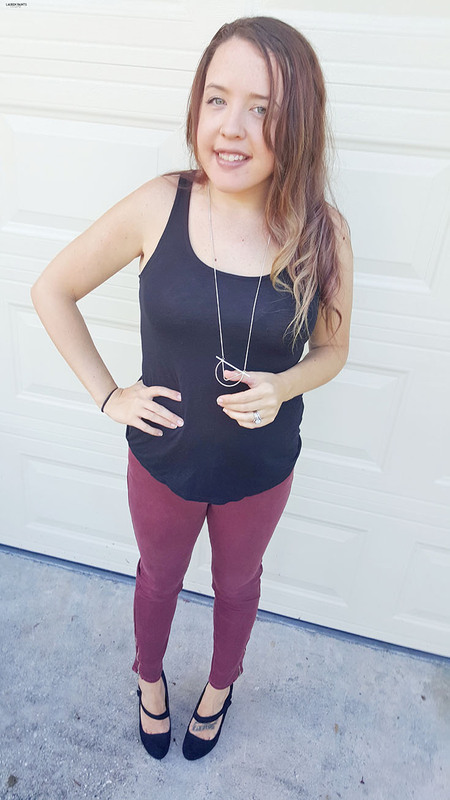 A gorgeous pair of Just Black burgundy jeans made exclusively for Stitch Fix and an amazingly cute open back black top, with an adorable, unique necklace... 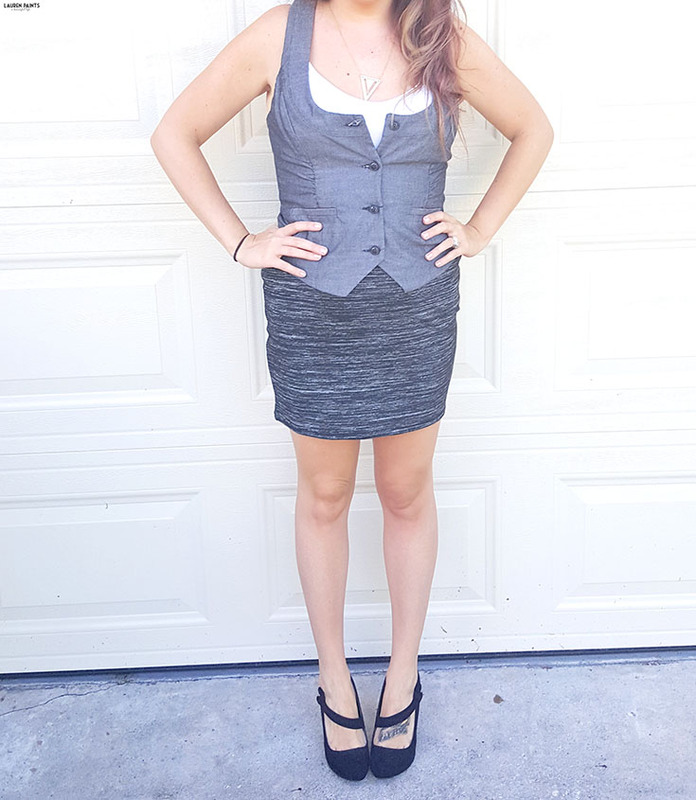 I felt like a rock star when I put this outfit on. The shirt is the coolest ever, but it's a bit unflattering for my specific shape; the thing is, I still love it. I want to keep it. The swoop of the slightly open back, the loose fit, the super soft material - it's such a dreamy piece of fashion. I'm wavering between thinking I love it and thinking it doesn't look that great on me... All I know is that it's just so cute, it's hard to let go. What do you think, should I hold on to the black shirt or nah? 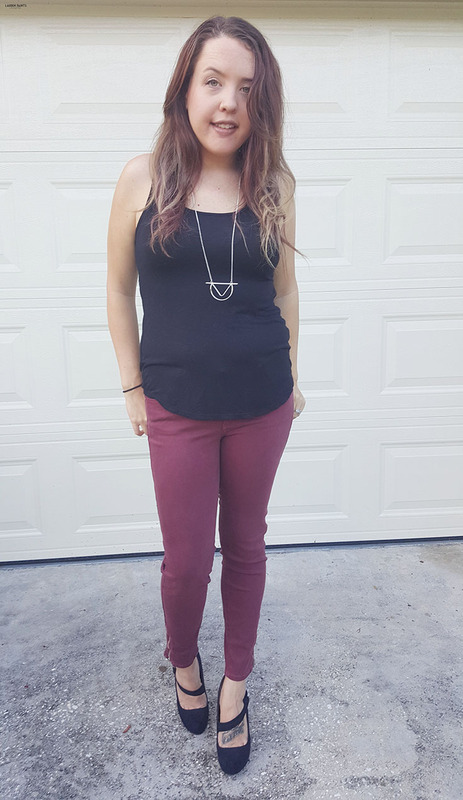 This fall, I'll be the first to admit that I'm a big fan of the burgundy pants! This pair is probably the best shade and fit I've ever seen though! 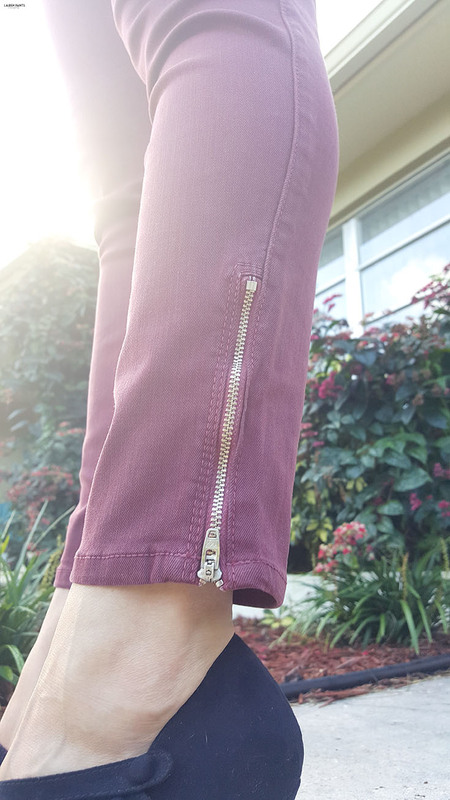 They are so comfortable it's like they were made specifically for me and the zipper detail on the leg is the perfect little edgy pop. 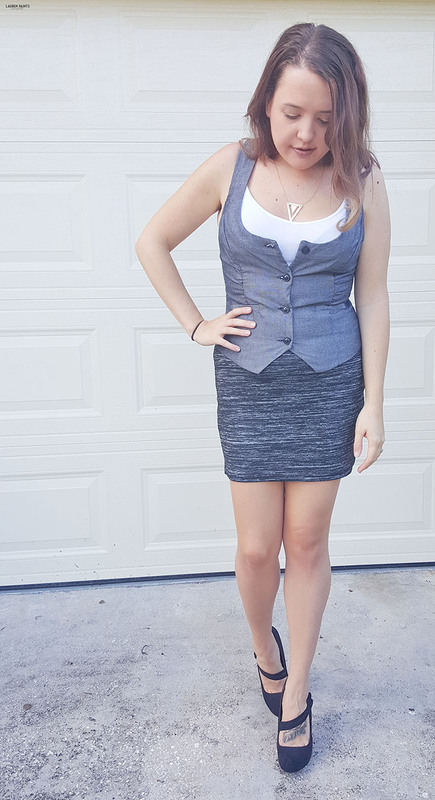 Paired with a black shirt and a black pair of heels, this is a look I can rock all year long! What do you think of the pants - yay or nay? 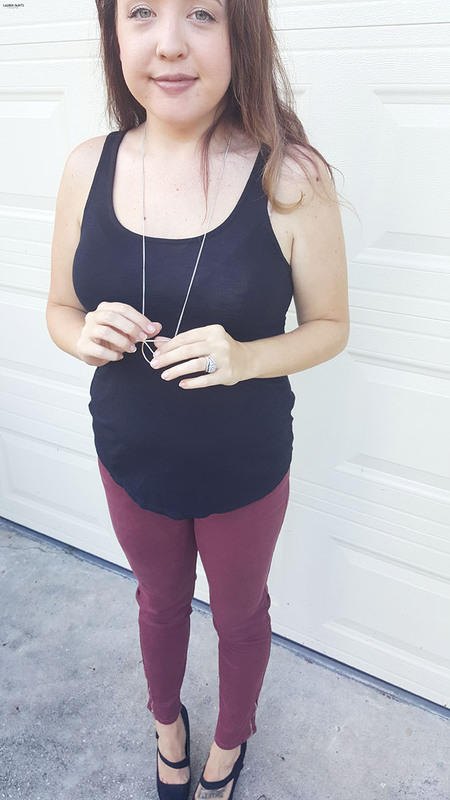 Now that I've shared what came in my fix, maybe I should explain exactly what Stitch Fix is... in case you don't know already! Simply put, Stitch Fix is a personal styling service. They send 5 items of clothing and/or accessories, straight to your door, either monthly or as often as you choose. Earlier I mentioned that if I kept all 5 items I get a discount, what's cool is that's the deal for every fix. I do need to mention that you agree to pay a $20 styling fee per box, BUT that $20 goes towards whatever you choose to keep so it's basically like pre-paying for an item. 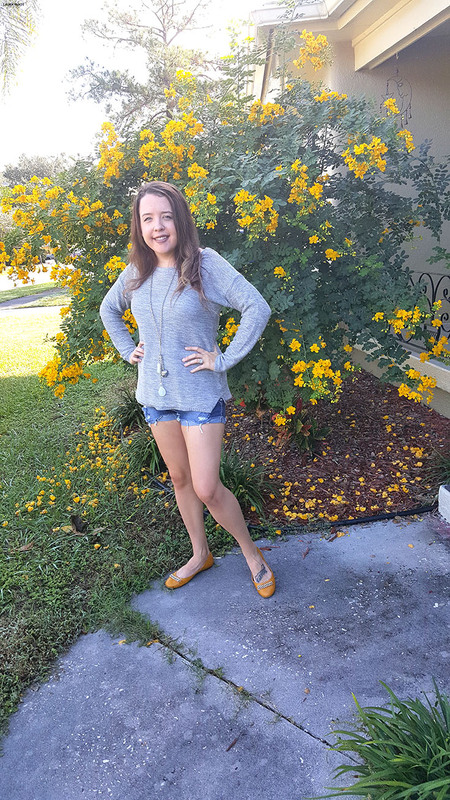 It's all so simple to sign up and you score a gorgeous, stylist-selected wardrobe - what's not to love about Stitch Fix? 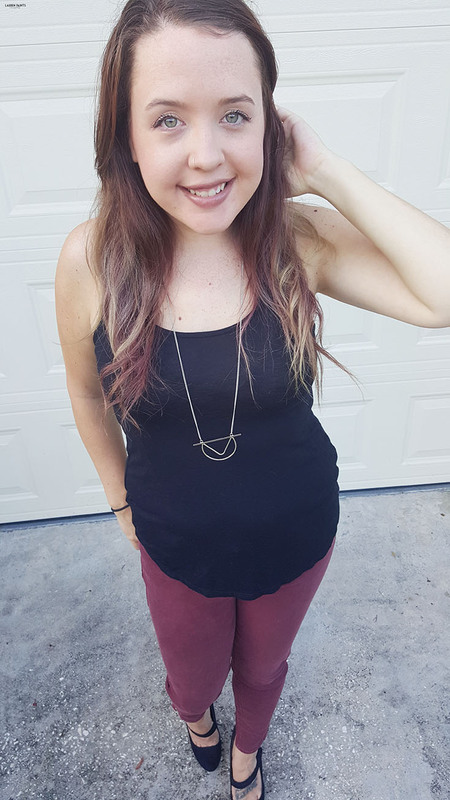 Get access to your own personal stylist TODAY and get fixated on Stitch Fix with me!